Bounded by Hill Street on the West, Los Angeles Street on the East, Third Street on the North, and Olympic Boulevard on the South, the Historic Core is one of LA’s oldest and and most intriguing neighborhoods. A century ago, the intersection of Spring and Main was essentialy the Wall Street of the West, but as banking and finance migrated to Financial District skyscrapers and elsewhere, the historic streets and fell into neglect. Walk these storied streets and you’ll discover some of the city’s most notable architecture, such as the Eastern Columbia Building, Bradbury Building, The Edison, and the Broadway Theatre District, featuring the largest number of old movie palaces in the United States. The Historic Core is also dotted with eclectic shops, art galleries, bars, and restaurants, and destinations like the Grand Central Market. Ready to start exploring? Historic Core BID Walking Guide here. “Walk the Historic Core” printed map guides are available at Grand Central Market, The Last Bookstore, Ace Hotel, IndieDesk, Ilcaffe, Gelateria Uli, and other retailers around the neighborhood. Established in 2011 as an LA-inspired men’s accessory brand, Pocket Square Clothing has become an incubator for the burgeoning LA menswear movement. With no formal fashion training, founders Rodolfo and Andrew have created a lifestyle brand beyond clothing, geared toward the modern urban gentleman. Starting with the bow tie, their collection features menswear staples, a plethora of accessories, and Made to Measure suiting and shirting. Pocket Square Clothing takes pride in its domestic manufacturing and attention to detail. Using traditional techniques, everything is carefully handcrafted by some of the oldest remaining craftsmen in the heart of Los Angeles. Each piece comes with a narrative and fully handcrafted vintage inspired packaging. LA is clearly getting Aussie-fied! Headquartered in Melbourne, with offices and stores around the world, Aesop is your go-to for deliciously aromatic skin, hair, and body care formulations, along with fragrances, sprays for the home, and gift and travel kits. Since its inception in 1987, Aesop has sourced the finest quality plant-based and laboratory-made ingredients from across the globe, with a proven record of safety and efficacy. Ready for a facial detox? Try the Parsley Seed collection, featuring Cleansing Masque, Anti-Oxidant Serum, Anti-Oxidant Facial Treatment, and Anti-Oxidant Facial Toner. Nourish and purify your skin with Geranium Leaf Body Scrub, an invigorating blend of Pumice, Bamboo Stem, and purifying botanical oils that sloughs away tired cells and leaves skin cleansed and smooth, perfectly prepared for hydration. For a relaxing respite, cleanse, calm and warm your skin with Coriander Seed Body Cleanser, a richly aromatic formulation enhanced with Coriander Seeds and Black Peppercorns. Raw Materials Art Supplies is a rare commodity these days—an independent art supply store in the heart Downtown Los Angeles. Hunkered down in a bright, minimalist space, Raw Materials stocks thousands of art supplies, tools, and materials at every-day low prices, including many top brands of paints, stretched canvas, and brushes. The store has partnered with Castelli Art Framing, to offer professional custom fine art framing services to the downtown community. Raw Materials handles the design work in their store on Main Street, where you can drop off and pick up your artwork, certificates, or other pieces to be framed, or you can arrange for pick-up and delivery at your office or residence. Celebrity customers include painter Salomon Huerta,whose work is exhibited and collected all over the world, including the Whitney Museum, National Portrait Gallery, Hammer Museum, LACMA, and MCA San Diego. A true DTLA treasure, The Last Bookstore is California’s largest used and new book and record store. 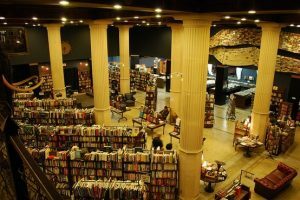 Named one of the most beautiful bookstores in the world by Flavorwire, The Last Book Store is housed in a stunning 22,000 square-foot space in the Spring Arts Tower at 5th & Spring. 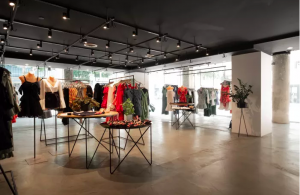 Currently in its third incarnation, the store began in 2005 in a downtown LA loft, when owner Josh Spencer took his decade of experience selling everything from cars to clothes online and focused instead on his first love: books. According to Spencer, the name was chosen with irony, but seems more appropriate with each passing day, as physical bookstores die out like dinosaurs from the meteoric impact of Amazon and e-books. In addition to over 250,000 new and used books on two floors, including the Arts & Rare Book Annex, the shared space includes tens of thousands of vinyl records and graphic novels, and a huge mezzanine level featuring the Labyrinth Above the Last Bookstore, Gather Yarn Shop, and the Spring Arts Collective gallery shops.